When performing a search on a search engine such as Google, users view a ‘Results' screen that is broken out into primary and secondary viewing areas. 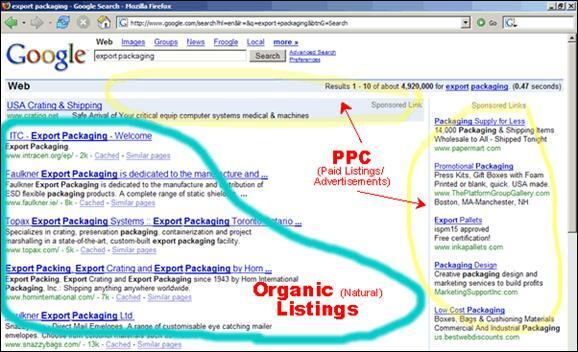 The main body with listings is from natural placement of the web sites ranked by the individual engines’ algorithms, called organic placement. The right side bar is for paid advertisements, where companies bid on gaining the top position for click-through rates. This advertising model is also known as PPC, or Pay Per Click. In addition to the right column, engines sometimes offer space above the organic listings for ‘Sponsored Links’. This is a second and more expensive position for the PPC model. We employ a 4-Step process in the optimization of a clients site. Many companies talk about Meta tag creation and content; very few speak about DTDs. DTDs are document definitions, and are the basis for any electronic document. The engines admit that over 100 DTDs are available for algorithm relevancy measurement on a web site. We consciously select the top 20 elements in an optimization engagement, then enhance this with our other steps to create a robust and survivable program for our clients. Should I Use Both Strategies? While the organic listings may achieve a 95% click through rate, remember that the 5% PPC clicks are generally highly qualified browsers. These viewers may also be highly motivated buyers, so a combination of both strategies is recommended to surround the search engine viewers with alternative means of accessing your site.